I first came across this book almost five years ago as I was browsing the online catalogue of Pratham Books. I was fascinated by whatever little I could figure out and called their office to find out if they had a copy. They did not, it was out of print. They have finally done a reprint and I suddenly came across a copy last week. 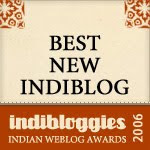 Both the testers in these parts have given it a big thumbs-up, its been worth the wait. 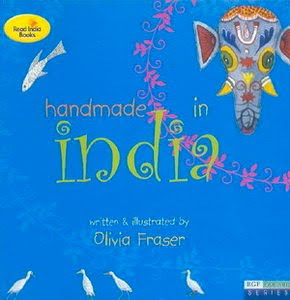 Olivia Fraser is a Scottish artist married to William Dalrymple - one of my favourite authors, and they spend their time between Delhi, London and Edinburgh. The book in question is a travelogue of sorts - Fraser takes us on a delightful journey around the various states of the country and gives us a glimpse of some of the many things that are handmade in India. The illustrations are each a work of art. In the hills of Himachal Pradesh she met two women who were spinning wool and knitting it. She tells us in detail what the women are doing, and on top of the page is an outline of India with the state highlighted. The corresponding full page illustration shows two women in traditional garb made of the wool similar to what they are working on and surrounded by sheep. On the next page Fraser takes us to Haryana where she met women drawing water from wells. She tells us how these amazing women balance two pots one on top of the other on their heads and asks the reader if (s)he can do that. The illustration shows women in vibrant clothes around a well. Then there is the sculptor she met in Karnataka who she saw was making a statue - can you guess whose she asks. My little reader guessed correctly - the elephant-headed god! The picture of the man as he is working is framed by the various statues he has made and the tools he uses to create his magic. And on she goes. She travels through Karnataka where she met workers in paddy fields and Banjara women collecting firewood in forests. Their backs must ache by the end of the day she thinks. In Goa she meets workers mending a railway track. The picture is stunning - you have to see it to know what I mean. In Orissa she meets crafts-folk who are creating beautiful images of Jagannath and also elephant masks. She asks us what we like best. We meet a 'thathera', brick-makers and fisherwomen in Bengal, and finally a group of women preparing a huge feast for a wedding in Rajasthan. I showed it to a friend and she loved it as expected. She did not know how much it cost and when asked how much she would be willing to buy it for, said between two and three hundred rupees. Well the book is priced at a tenth of that, so go get a copy! Edited to add: Take a peek - here's a visual trailer. chox, thanks to your review, I realised that we had this book at home! It has some very simple and neat illustrations! Chox ~ All three of us enjoyed reading this book and appreciating the illustrations. Sathish ~ Yeah. Ranjani picked this book up when she came to this part of the town.